Update on 29 Oct 2017: The India-Russia joint issue was issued as planned on 26th October on the Russian dance Bererzka (or Beroyzka) and the Indian dance form Bhavai. The Russian 'Marka' released two stamps as a sheetlet with 4 stamps of each design and a label in the center of the sheet. Russia also prepared a presentation pack with stamps from both countries included. India Post issued the two stamps in a slightly different design in two sheets of 45 stamps each and a souvenir sheet of 2 designs. Both sides also put cacheted first day covers for sale. The Indian souvenir sheet shows historical monuments from both the countries in addition to the two dance forms. India's Hawa Mahal in Jaipur and Moscow's Saint Basil's Cathedral are depicted as the background for the dancers. Hawa Mahal is located in the city of Jaipur in the state of Rajasthan, which is the state of origin of Bhavai dance as well. 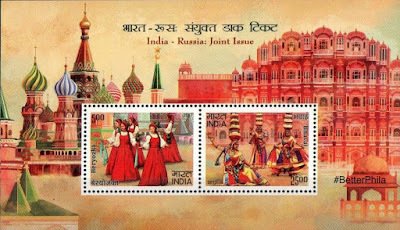 The Indian stamp and souvenir sheet were designed by Kamleshwar Singh and the Russian stamps were designed by V. Beltyukov. The souvenir sheet from India was particularly well designed. Kamleshwar Singh has designed some of the best stamps for India Post over the last two decades. The art work was well planned and the souvenir sheet had continuity of design beyond the stamps. Unlike the Canada-India joint issue, no big celebrations were organized for stamp dedication. Officials from the Indian Embassy visited the headquarters of the 'Marka' and were presented with a framed version of the Russian stamps. No other ceremonies have been reported so far. A total of 25 sheetlets have been printed by Russia whereas the 0.5 million stamps of each design and 0.1 million souvenir sheets have been printed for the Indian products. Copied from Utsavpedia: Bhavai is a folk dance with swaying and twirling movements that is performed by women from certain tribes from the state of Rajasthan. This folk dance is one of the state’s most exciting dance performances as it involves tricky balancing acts, right from balancing seven to nine brass pots on the head to balancing oneself (along with the pots) on narrow and unstable objects like a glass bottle, brass plate or the edge of a sword. The brass pots can, and are often, substituted by an even greater number of earthen pots. Bhavai is also one of the most colorful performances of the state as the women wear bright colored ghaghra cholis and dupattas. The men from these communities offer the music to this dance, using string and percussion instruments. Bhavai dance is often misinterpreted from ‘Bhavai’ which is a folk theatre form of Gujarat. 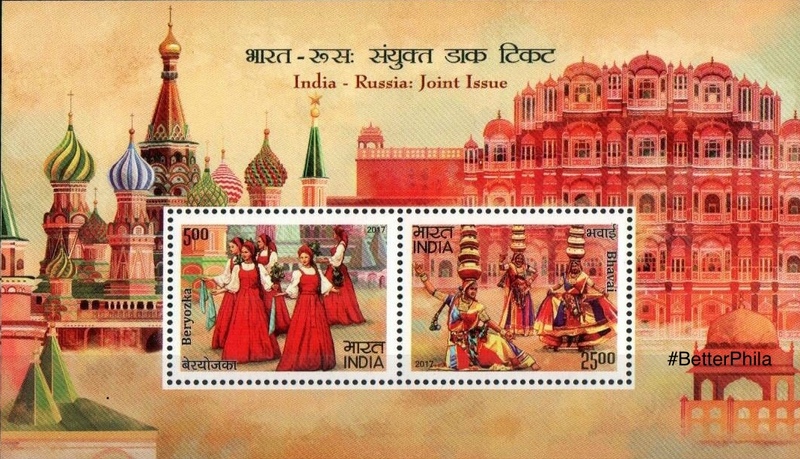 From Indian stamp brochure: Beryozka round dance is one of the famous Russian folk dances. This is an ancient round social Slavonic ritual folk dance. Dancers hold hands and the disctinctive element of the dance are simple steps in a circle simultaneous squatting of all dancers on a certain beat of the music. A stage version is based on the folk dance. In this case, women perform it wearing psuedo-Russian stage outfits, styles on the Nizhny Novogorod girls (a jacket, a sarafan, a kokoshnik or a headscarf) their hair is braided. The dancers move in a circle, after each other, in single file, in two lines, rotating around each other or in pairs around common centers in the groups. The steps are short and frequent, creating the impression of slipping (like a swan swimming). The dancers hold handkerchiefs or branches of birch in their hands which symbolizes farewell to the spring. The general mood of the dance is melancholic. Update on 10 Oct 2017: A new joint stamp between Russia and India will be issued in 2017. The stamps will depict folk dances from both the countries. I will add more details once images for the stamp issues are available. Russia Post has announced 26th October as the date of issuance. India Post and Canada Post had been planning on issuing their first ever joint stamps at least since November 2016. 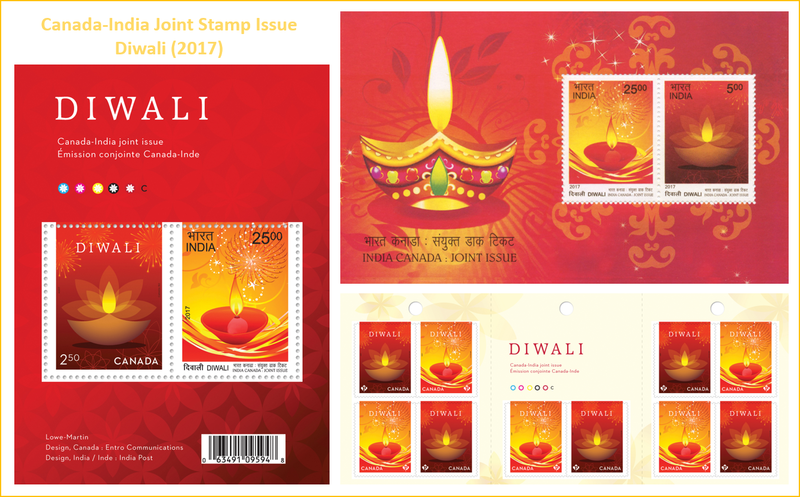 India Post's stamp program for 2017 actually listed joint issue with Canada in two themes, but I'm not sure what was the plan for the second theme. Top officials from India Post and Canada Post met in Toronto in February 2017 to put an agreement in place to design and release stamps in September 2017 to celebrate the Hindu festival of lights, Diwali. These stamps were subsequently designed and issued on 21st September. 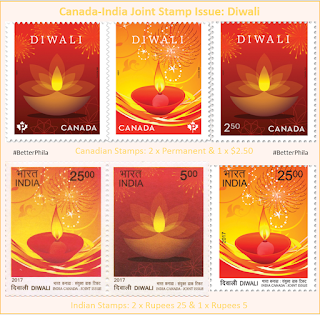 Canada Post had remained silent on the issuance date and designs for these stamps until the day of issue, but the Indian Government had announced the release in the last week of August. The federal government's Cabinet was informed of the joint issue with Canada on 30th August 2017. 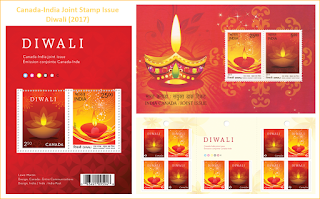 Two stamp designs were used by both postal administrations to depict the Diwali festival. Gerald Querubin of Entro Communications designed the Canadian version and Alka Sharma created the art work for the Indian side. Both countries used the same stamp designs and the issuance date for the joint issue. Canada post issued the two stamps as 'Permanent' rate in a booklet of 10 stamps whereas India Post issued one stamps in Rupees 5 and the other one in Rupees 25 denomination. 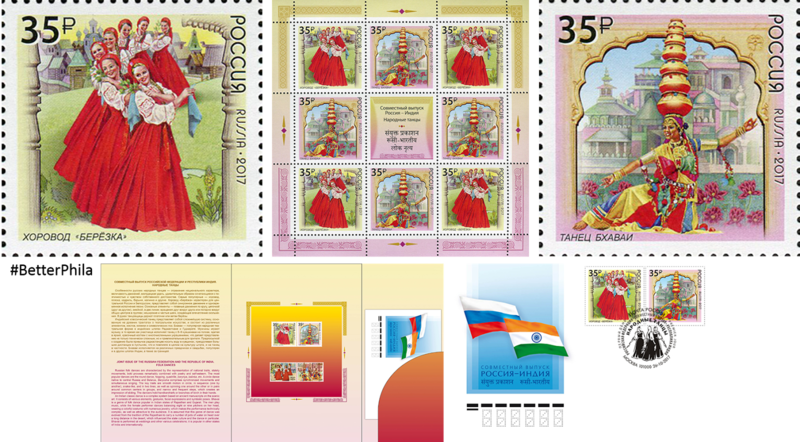 India Post also issued a souvenir sheet that has both the Rupees 5 and 25 stamps. Canada Post issued a Siamese twin souvenir sheet, which contains the Canadian stamp in C$2.50 and the Indian stamp in Rupees 25 denomination. Lowe Martin printed the Canadian stamp booklet and the joint souvenir sheet whereas Security Printing Press, Hyderabad printed the Indian stamps and souvenir sheet. The stamps were issued on 21st September, in two ceremonies at the home of the High Commissioner of Canada to India in New Delhi and at the City Hall in Toronto. Diwali festival is celebrated in the Kartik month of the Hindu calendar. The festival celebrates the triumph of goodness over evil. Goodness is symbolized by light and evil by darkness. Many Hindus, Jains, Sikhs and Buddhists take part in these annual festivities. A few weeks before Diwali all places of worship, work or living are cleaned and decorated. Many communities follow cultural traditions by lighting small oil lamps (called diya), cooking sweets and festival feast and by creating art patters (called rangoli) using paint or flowers. Families and friends also take part in fireworks displays and visit elders to get their blessings. Many businesses prepare new account books and pray for god fortune. Diwali is celebrated based on many historical/mythological events, which vary in different communities. One of the beliefs is that Lord Ram returned home on the day of Diwali, after fourteen years of exile. One can buy the Indian stamps from ePostOffice and the Candian ones from Canada Post. 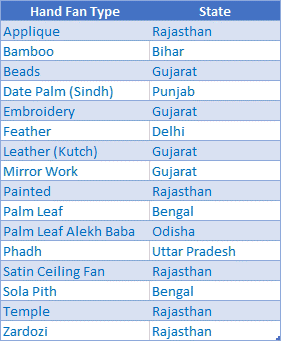 India Post will likely issue a set of stamps on traditional Indian Hand Fans in the last quarter of 2017. The stamp issue was first proposed for issuance in 2012-13. 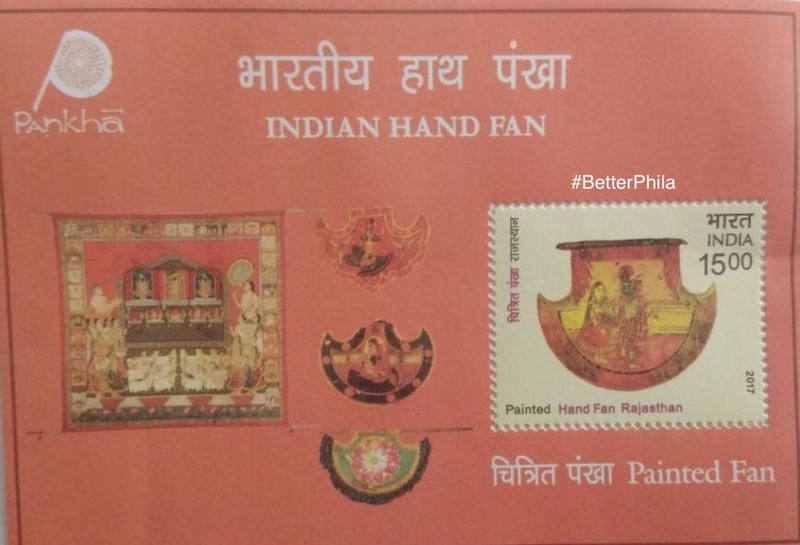 These stamps have been designed in conjunction with the well renowned artist, Jatin Das' collection of Indian Hand Fans, known as Pankha (the word for fan in Hindi). This will be the second set of stamps in 2017, after the Transport stamp issue that uses a private collection as the source of stamp objects. 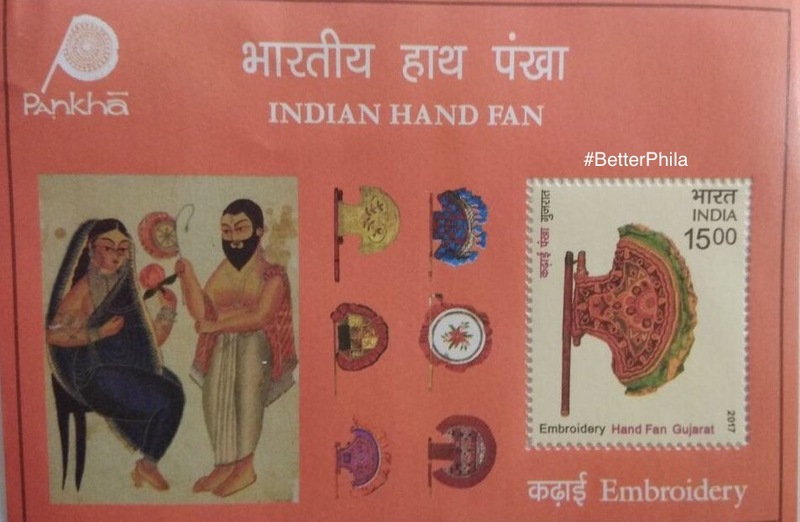 Indian Hand Fans on Postage Stamps (2017). So far, its become clear that this set of stamps will contain of a miniature sheet with 16 designs and possibly 16 other miniature sheets with individual stamps. Each of the stamps will be of Rupees 15 denomination. 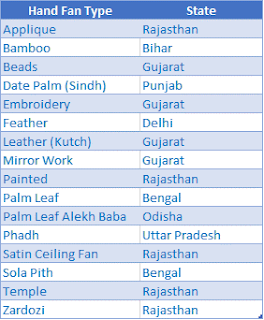 A list of hand fans that are depicted on the stamps is below. These 16 stamp designs are on one large miniature sheet and then each of these same type of hand fans are also depicted on miniature sheets with single stamps. This issue is like an amalgamation of the Splendor of India and Transport stamps issues of 2017. I say that because the individual and one large miniature sheet format was used for the Splendor of India issue and the similar to the Transport stamp issue, there will likely be 4 sheetlets with a set of 4 hand fan designs per sheetlet. The striking feature about this stamp issue so far is that the individual miniature sheets may or may not have the same stamp design/formats are the large miniature sheet and this could create way more than 16 stamp designs in the stamp series. I've posted a few images for reference below as well. The stamp designs are quite simplistic and could evoke different opinions among the collectors. I personally liked the individual miniature sheets more than the large miniature sheet, which is quite plain with just the fans placed on a white background. The stamp set will likely be printed at India Security Press, Nashik. 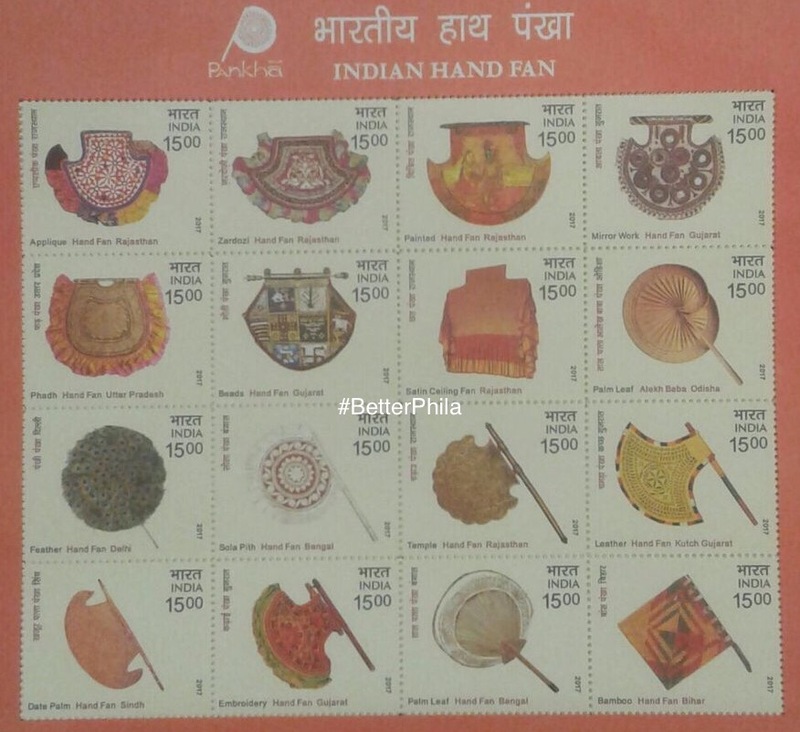 Indian Hand Fans Postage Stamps Miniature Sheet (2017). 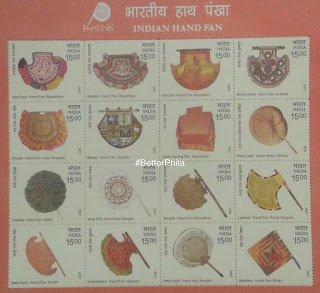 Indian Hand Fans Postage Stamps - Individual Miniature Sheets (2017).